What else? Well, I did a short online class from Carla Sonheim. 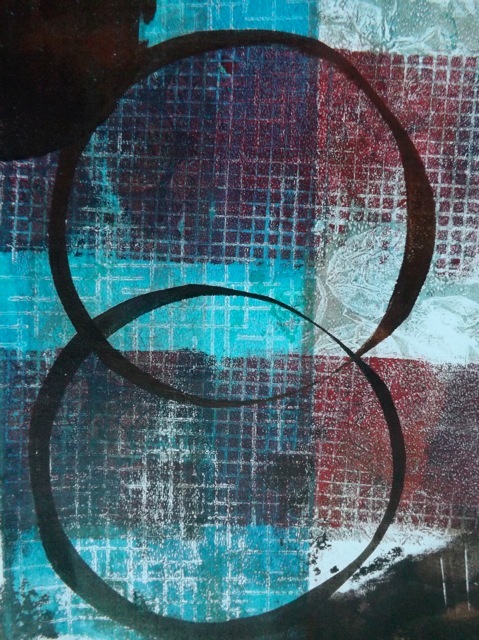 I stumbled across her work and loved the unusual Gelli prints she makes – very different to most. She has a handful of techniques that I am not very good at but she inspired me to create a “tool” (and I use that only in the loosest sense) to help me achieve the look I wanted but seem incapable to doing they way she does. My prints are nothing like hers, really, and I’m not 100% happy with them but I’m getting there. and in fact my desk is not as horrible as it has been the last few weeks because I cleaned up the flag book mess so I could make a different kind of mess. I have to sort thru my photos, but I’ll share my tool tomorrow. Now I am happy with it, I just need to play a bit more so I can have some samples to share and explain the process. It’s not rocket science, but I found it helpful in getting the look I wanted. And I want to explore the possibilities a little bit more. Off with DD for ice skating and shopping to fill the empty fridge today, but I’ll return any visits one way or another! 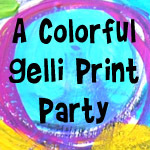 Categories: Gelli plate monoprints, Uncategorized, WOYWW | Tags: Gelli, WOYWW | Permalink. Oh see. Now this is why I’m glad I started WOYWWing again! 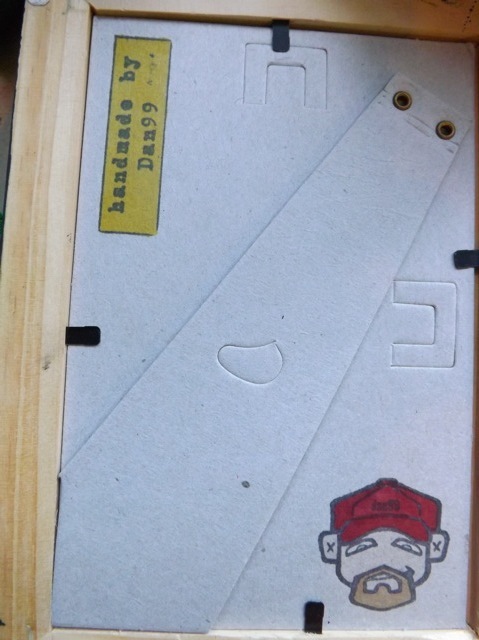 Just adore the gifts you and Dan did for each other – I already loved your original Stampotique bath tub shrine(I’m guilty of a bit of silent lurking) but his is perfect too! And his gift to you, wow. Powerful. 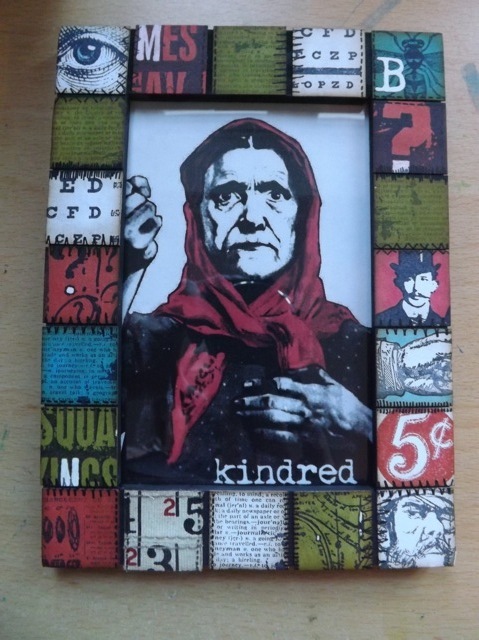 Second – I’ve been dithering about Carla Sonheims Gelli class since it came out. Like you I really love her style – after reading this I may treat myself after Christmas 🙂 I love your tool – have pinned that! Thanks as always for your generous sharing in your experiments. Oh what a fabulous surprise in the post, its lovely. 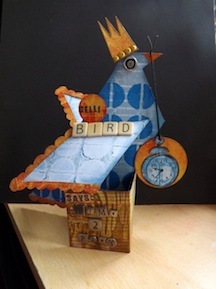 I was lucky enough to be on a paperartsy Tim Holtz course and shared a table in one session with Dan99 a couple of years ago, a lovely chap (though he wont remember me). You got a lovely gift from Dan! 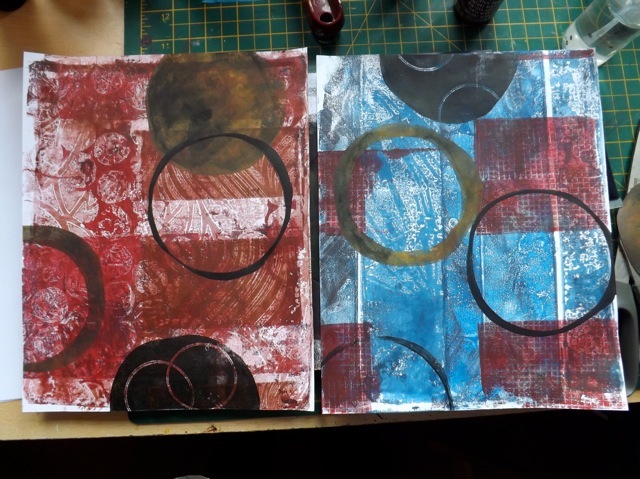 It is just so amazing the things you do with the gelli plate! I haven’t done much at all but once I have more time I will study it properly! I hope that when we get together at the crop we could play with it a little bit – maybe you can share some techniques! Thank you for your kind words for my mom! And please turn the lights on!!! I’m totally intimidated by your output and ideas, as you know, and dan99 does exactly the same to me, am completely lacking in the gene that makes you two so fast and loose with the slightly off track images and colour combos. loved your flag book post and this gelli thing jsut won’t wear off for you, huh..good value I say!! I almost didn’t find the place to comment. Love all that is going on here and what a wonderful gift. That is a gorgeous gift, lucky you. We really like your prints, they look fun. Thanks for the peek into your creative world today. Great gift from Dan. Hi, I am loving following your blog, such interesting stuff. I took Carla S class too. I haven’t mastered yet but having fun anyway. I can send you a link if you let me know your email. 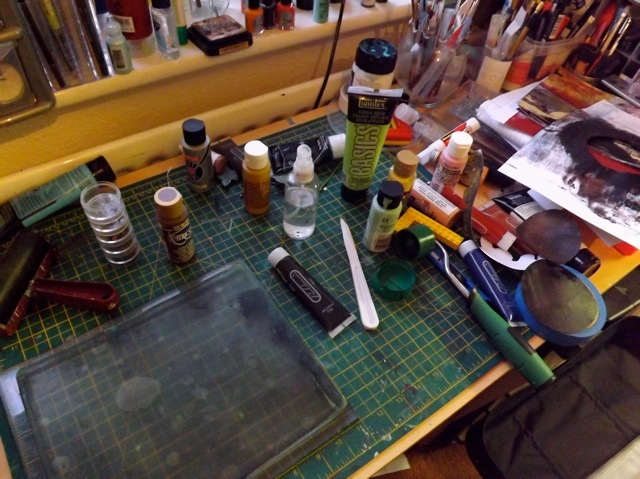 So good to see the gelli on the desk with the paints at hand, I so enjoy reading your posts and finding out what you are up to. 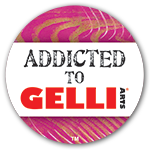 You will achieve the results eventually it does take time and practice I believe but you are the best at Gelli printing.